Shitrace is a direct translation from the Dutch word strontrace, which is the name of this race. The object of this race is to transport manure (stront). This week the ships of the shitrace came by our barge. It was an imposing sight and we are front row here. Since 1974 this an annual race, from Workum (in Friesland) to Warmond (in Zuid Holland) and back. 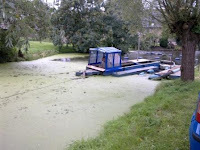 In the olden days, the manure for the bulbfields was transported along that route and the vessels may now only do it sailing, hunting and poling. They must pass through the Spaarne, and since we are located next to a bridge we could see very well how they do it. They are big heavy boats and the crew, on both ships there was at least one woman present steering and encouraging, was visibly tired but they still had a long way to go. The first ship that passed had the misfortune of having to wait for the bridge had until the other was close enough. Their advantage was that they were in a straight line for the bridge when it opened (in the morning during rush hour in Haarlem) and they were quickly through. We finally really arrived in Haarlem and it is very good here, more on that later. Although only in late September, we could already see autumn coming, the summer flowers in the bags have been replaced by winter blooming pansies and spiders are very active throughout the ship, it does provide a nice picture. Wednesday, September 29 we left Gouda, we passed at 11am through the lock, at that time the doors on either side of us could open and close again right behind us. It has something special as a lock to pass. En route to Alphen aan de Rijn, we called a friend who lives there and since we could moor right in the middle of the city she could join us for tea. In Alphen we decided to stay so we could eat together and there was a good berth for a few days. However nice there, the next morning we left since all the passing, commercial, traffic causes such draught and waves that even we were bouncing against the wall, it was no fun. In the Gouwe we passed some beautiful lift bridges, three in a row, impressive buildings as you come sailing along and pass underneath them. Just before we arrived at the Braassemermeer there was a fuel station with red diesel. We stocked up for the winter so the stove can burn nicely. While we were there, it takes a while before you have 2000 liters of petrol, a thick fog came up. We did not look forward to proceeding in this soup to Haarlem but fortunately the pump owner also had a marina where we could stay for free because we had already tanked enough. The fog quickly disappeared and we lay there with lovely views over the Braassemermeer, very nice. The next day we did really the last stage of this season, through the Ringvaart to Haarlem. One of the most "Dutch" routes, past villages, many greenhouses and several mills and all with beautiful weer. This last part became special. For the bridge in Lisserbroek we were behind the Nelleke, a large empty commercial sand ship. The bridge was temporarily out of work because of a broken engine and thus caused the Nelleke trouble. They had to sail through Haarlem before 16 am (between 16 and 18 hours there is no passage trough Haarlem) otherwise they would miss a cargo and a lot of money. The workers at the bridge managed to open it just for the Nelleke and we could pass along. The Nelly shot with great speed through the bridge and raced on further. Michel thought he could easily pick up at the next bridge but all the bridges opened as the Nelleke aprouched she went with a speed of 12km per hour (6 is allowed) through the canal. We followed with the same speed went just as smoothly through all the bridges and asumed that all oncoming traffic was out of the way because of the Nelleke. With brakes squealing, we could stop in time for our winter berth just behind the Langebrug Spaarne (see link) and Nelleke raced through, hopefully they got there in time. It was fun and exciting (for once) and actually also good for the engine before the winterstop. It suits us very well in Haarlem, it is friendly, nice shops, restaurants, cinema, in short all the pleasures of city life. We were fine without and enjoy it now that it is there, we can live here well till april. The first weeks will be spent completing a variety of projects, there is a ceiling and lighting in the wheelhouse, the guest bathroom is completely renovated and a new sink (an old sideboard from the original rear deckhouse) installed there and then we go on to the living room one more time. Now that we don't move anymore in the coming months there will be little to mention on the blog. Perhaps the sailing in of Saint Nicholas as he comes along our ship or when something special happens or if we have worked out our plans for next year I will say so. For the winter I stop the blog and when we go sailing again I'll continue. If you want to know if something is posted or the site is updated, notifie us through the link following 't Majeur, at the top on the right, and you get a message. Finally, it's nice to have a map showing the entire route we have sailed through the Netherlands. We really enjoyed it and it was as if we discovered our own country. Although next year we plan to sail in France, north-west France, we will certainly once do an different tour in Holland, we still much to see. We travel in a snail's pace since we are still on the Hollandse IJssel and so untill now have not decided wich route to follow to Haarlem. From Montfoort are we went to Oudewater, a distance of only 8.5 km that took us about 2,5 hours. The Hollandse IJssel, especially that part, is very narrow and because we are big and therefore move much water we can go only very slowly to ensure that we don't get "unmanageable" because there is not enough water under the keel. That's no problem because you can control it, much more annoying is oncoming traffic that does not move to the side and expect us to swerve to the side so far that it;s sometimeswe have that the tricky to get back to the center, especially rental boats are a nuisance. In Oudewater we stayed until after the weekend, Michel went to Amsterdam for a day and we enjoyed the Port Days of Oudewater, much noise and when it grew dark and an illuminated procession of decorated boats that were sailing past us. When walking in the neighborhood I saw the littledredge boat, I thought it was a goodsystem. In Oudewater we also found the perfect lamp above the table in the wheelhouse. Monday morning we left Oudewater with the intention at least get to Gouda. To get there we need to pass the Waaiersluis, the transition of the channeled Hollandse IJssel, which we navigate now to the Hollandse IJssel, the tidal river. 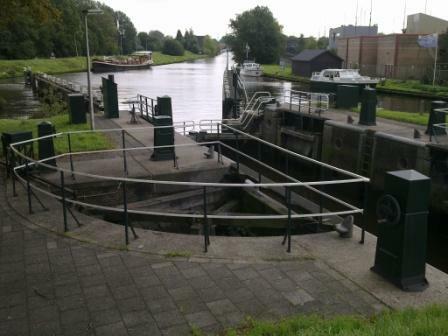 The lock is not big enough for us, just 24.5 meters, but 4 times a day but the water level is equal on both sides and all doors can be opened at the same time for 10 minutes to make passage possible. We had called and understood that we could pass at 13.00 hours. That was a mistake, we had to wait a couple hours. The lock was bild around 1850 and the special thing is that there is a double set of doors and the doors, through an ingenious system can be opened against the current. Autumn is coming now, the leaves change color and the morning mist hangs over the water, good for pretty pictures. After another visit to Amsterdam we leave here Tuesday, and than have to determine the route. I forgot to report on developments in the vegetable garden, which was/is no easy task! The first seeds hardly grew since the combination of sun and wind is too intense. The earth dried out to much, despite my faithfull watering. I made a sort of wind screen around it, put in some new seeds and some small plants (otherwise it becomes too frustrating). Now that it gets much colder at night and also occasionally we heavy rain we made a kind of greenhouse which can be opened during the day and closed at nicht, it keeps me busy. Now the lettuce grows, the radishes are doing well and I'm learning. Next year with the greenhouse I can do some early sowing. All the flowers and the garden get a lot of, positive, comments from passers by, both on the water and on the side. It is been outrageous long ago since I've updated the blog and I will now try to make up. It was really caused by poor internet, but also because we have been very busy, yes you can be very busy even if you lead a life like ours! Many visitors, very nice, we made several day trips, beautiful, went ourselfs for a few days to France, something different, and we have done no work on the boat, so that remains to be done! After we left Nijmegen we stayed a week in the little village of Batenburg on the Maas (Meuse), our friends live in a beautifully restored mill just opposite in Dieden. With a little footferry we could cross up and down for visits. From there we moved on a little to Alphen a/d Maas, new scenery but still close enough for visits. We were moored in a big sandpit and had a beautiful vieuw over the lake and the Maas behind it. We had friends and family who visited us and I payed a visit to the model gardens of Apeltern. They are beautiful and you get great ideas, though of little use in a square meter garden. Because we liked it there and we were sheltered during the few days that the weather was very bad and we had a beautiful setting for skating, barge daytrips and cycling during the days that the weather was fine we stayed there until we left Saturday, August 28. The trip to Arkel took a long day sailing. Usuely we do no more than 4-5 hours a day, which we think is long enough. That day the weather wasn't very nice and we passed no enticing places to stay, so we continued. The plan was to stay for a few days in Woudrichem, because it is such a beautiful town, but the mooring fees that they charge are so excessive that we have passed it and crossed the Waal, strong winds and waves but thankfully just a short bit and then through Gorinchem and on to the Linge. To get there we had to pass under a bridge that, accourding to the almanac, was just high enough. We have a small flag pole on the very forefront of which the upper part by a bending spring is connected to the lower part. The height of the pole is 10cm higher than the rear deck of the ship. 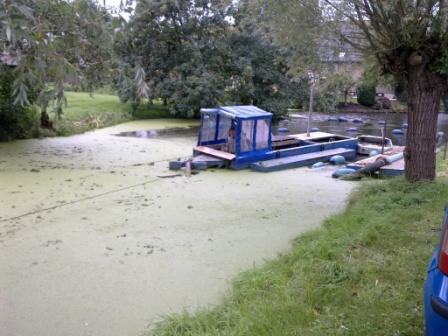 So we knew that if it the pole does not bend the rest of the barge can pass underneath. This was until that time theory so now was the hour of truth. Slowly we crept under the bridge, the pole went well, with little slack, but it fit. With pinched buttocks and ready to kick back, we went further and now we know that the theory stands correct in practice. In Arkel also we had a busy social life with lots of fun and visitors. It is obvious that we are away from the north, the distance to get to us is more manageable for many :-). We ourselves went a couple of days to friends in their house in Normandy. While the boys have felled trees and did other heavy work, the girls have been to Lille. We have talked about going to the big annual flea market for years but always something came in between, but now we really did go, full of anticipation. It was very big, noisy, busy, expensive, and basically everything 'to', but a fun time we had. The next day we went to the annual flea market in the nearby village and we found little treasures for a good price and there was not much noise and there were not many people and ...... we enoyed it so much more, am I getting old ?????? From Arkel we made several daytrips, with an without visitors, it is a peaceful, beautiful and tranquille river and countryside. We did not go up to Geldermalsen, there we would have had to turn anyway but Michel moored 't Majeur on the jettie in Leerdam, a true piece of steering especially since he had to go back again without turning, we had a lot of attention from all the yachts moored there. Through the Merwede Canal on Sunday, nice and quiet because most of the big boys are moored for the weekend, we went north. This was another good stretch, we continue to rejoice on the Dutch waterways. We passed the lock in Vianen and crossed the Lek river to continue the Merwedekanaal to Nieuwegein. From the Merwedekanaal you turn 270degrees to the Hollandse IJssel through the very, very narrow Doorlslagsluis (which fortunately is open) and exists of three parts that are not in line. In no time there were a lot of people, especially men, on the side who wanted to see where this went wrong, but it didn't. Michel even got compliments from the shorepublic. Meanwhile, we had again done more hours than planned and wanted to more there, as the ANWB card indicated was possible. It was clear however that it was no longer the case but we moored for one night anyway (illegally) almost in front of the St. Antonius Hospital, very special. This water is even smaller than the Linge and sailing has to be very slow but the smaller yachts always are in a hurry and want to overtake us as soon as possible, they do not seem to realize that they have to wait again till we reache the next bridge. We are now in Montfoort and it has rained cats and dogs all day, good wheater to update a blog. Tomorrow we bike to Utrecht to buy our special Espresso Coffee, we can get it only there. For us it is also useful to be nearer the Randstad. We want to stay a few days in Oudewater, the next village and then continue through Gouda to Haarlem. From just north of Gouda, we can choose from different routes to get to Haarlem, we have not decided what to do, more on that the next blog. Because of troubles with our internet connection I have not posted new blogs recently. We are working on it and hope to have stronger internet as of next week. Here the signs to proof that we went from the IJssel to thePannerden Canal and from the Canal on the Waal. We found it both a little bit exciting because we had already heard so many stories about the Waal, the bustle and the biiiiiig ships. Well it's all true but it is very easy to navigate, just like on the IJssel you use the blue board a lot, only not on our own initiative but in response. Since not all the big boys take the inside curve it leads to situations in which we had to zigzag between others, as above, where the other ships alternating had the blue sign up. I know of course that there are big ships here, I've also seen them before but never this close and as I myself am on the water. All in all an exciting and fun experience. As planned, we indeed left Deventer on Wednesday and went to Doesburg. Unlike planned, we have not left and are now, Sunday, still on the quay in Doesburg, simply because it is so nice here. Beautiful spot overlooking the river IJssel and behind us a beautiful little town. The journey over here was very nice, all the stories about the landscape along the river IJssel are correct, not only the scenery is beautiful and there are many magnificent buildings. We had various relatives visiting us and fortunately the weather stayed good most of the time. Unexpectedly we got the question from someone who had read the article in the Schuttevaer whether she and her partner could come for a night. Although it was not our intention we decided that we could say yes because we had already decided not to leave before Saturday. After some back and forth emailing the appointment was made for friday afternoon.Our entire schedule seemed to get in jeopardy when suddenly our friends from Wartena turned up on the motorbike. They had announced that they would do so one time. In anticipation of our other guests we were talking, we got a gift from them and when we opened it it turned out that they were our official guests, it was arranged through a friend of them so we would not know. Well that was successful, the surprise was great, the joke was on them and the fun for us all. We still have the idea that we own a large ship as a houseboat, not compared to the commercials, which is confirmed by family and friends who visit us. Sometimes we are corrected as another houseboat docks next to us, more than 10 meters longer and wider, and we are the little one. Along the quay where we are moored Doesburg is renovated and ther is new built. Where once factories stood there are today new luxury apartments. On the quaywall, also new, at various points white blocks are built in that as you might draw a line along them symbolize a wave. They also show the different water levels, measured daily at 8pm in the morning, in Jan / Feb 1995 when there were extreme floods. The difference in water level was 5 meters between the highest and lowest positions in that period. The highest level was more than 4 meters higher than it is now and that's a lot of water! Next to us a ship is moored that was built on the same yard as 't Majeur, Boot in Alphen a / d Rijn, but one year earlier. The owners have completely renovated and refurbished to look like the original, it is now a floating memorial and looks beautiful. They also have a copy of a book on that yard which we have repeatedly heard about but never seen. We now viewed the interesting pages and made a copy. It is nice to learn a bit more about the history of our ship. Tomorrow we leave here and finally get to Nijmegen, by the end of the week we should be in Batenburg. After our friends left we left for the quay in Deventer (far left you can see us), in consultation with a very nice harbor master we can stay a few days in this place. a prime location and very nice, especially since the first Sunday of August there is the bookfair in Deventer, the largest in Europe. We didn't know that but it was buzy an fun, right on our doorstep along the whole of the quay. Saturday my mother visited us for the day, there are excellent connections from Deventer to the Randstad, which makes it a potential winter mooring (we gave the harbor master something to think about). Because of the bookfair our children came for the day, very nice and both made good deals. Late Monday night there was a terrible gasoil smell on the quay, police, firebrigade and RWS came to look, and so there was a hassle on the quay. Many neighbourghs on the street or leaning from their windows, despite the late hour it was still nice weather. With torches they searched water, the ferry was used to look on the IJssel and with a ladder they climbed on an abandoned fishing boat. To be sure Michel looked in our engine room, but we were not the cause. They have not been able to find the source but the stench got less. There is always something happening on or around the water. From where we are we overlook a mill across the river and today we went to look there. It is a functioning wood mill with its own sawmill, driven by volunteers. The wood floats is in the water from the IJssel waiting further processing and is left for 3 years in the water. Inside the original saw, powered by the rotating blades from the mill, is used for cutting logs into slices. Wonderful to see and lovingly restored and kept by the volunteers. Tomorrow we leave here and go first to Doesburg, and the coming weekend we go further via Nijmegen.